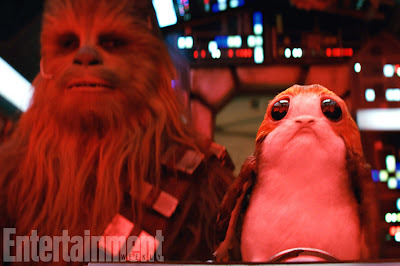 Ever since the behind the scenes sizzle reel for Star Wars: The Last Jedi debuted at D23 Expo last month, it seems all anyone can talk about in Star Wars is Porgs! Porgs are the small bird-like creatures who inhabit Ach-To, the planet where Luke Skywalker is in hiding at the end of The Force Awakens. As part of Entertainment Weekly's continuing coverage of The Last Jedi, writer/director Rian Johnson spoke with Anthony Breznican about the Porgs, as well as some of the other creatures and secrets that we may find on Ach-To. "If you go to Skellig (Michael--the island in Ireland where the final scene of The Force Awakens was shot) at the right time of year, it’s just covered in puffins, and they’re the most adorable things in the world. So when I was first scouting there, I saw these guys, and I was like, oh, these are part of the island. And so the Porgs are in that realm." But there are other creature on the island too. EW and Johnson introduced us to the Protectors of Ach-To, a new species of aliens who live on the planet and maintain the buildings there. 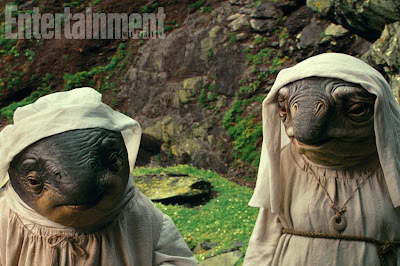 They are all female, with their costumes being inspired by real world nuns, and they "tolerate" Luke's presence on the island. Johnson also briefly discussed the history of Ach-To, saying, "My notion was this is a place that goes all the way back. This is where the cave paintings are." In other words, this is an ancient world with great significance to the Jedi Order. Not that the film will spend too much time giving fans a lecture on the history of the Jedi and the Force, but rather they will be hinted at and alluded to. Johnson did say that he rejected some of the early concepts for the first Jedi temple on Ach-To because they were too modern. You can read the entire feature on Ach-To here.